In the episode “Newton’s first law of motion”, I raised the question of what would happen if the block was moving on a surface which provided resistance to the motion. This is the type of surface which we encounter during everyday life. The resistance is caused by something we call friction. 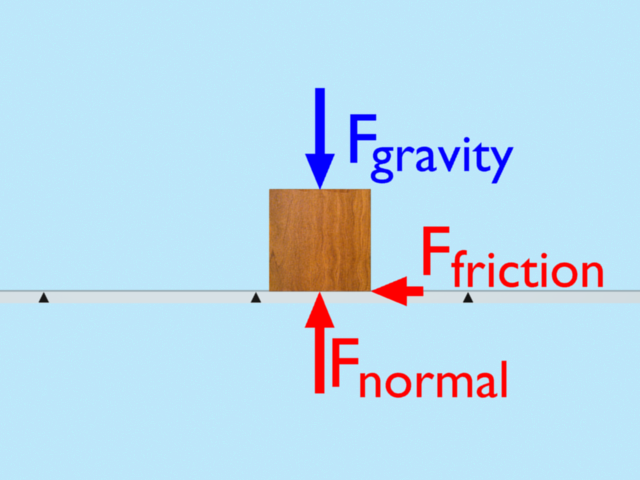 If the block was moving on a surface with friction there would be a resistive force to the motion as shown in the figure below. You can represent this friction as a force arrow. Looking at the forces you can see that the forces in the horizontal direction are now unbalanced. You can therefore conclude that the motion of the object will change – remember that an unbalanced force will change the motion of the block. In this case the the friction force will slow the object down until it comes to rest. When the block comes to rest the friction force reduces to zero. So how did you get on? Did you work out the answer? Is there also a Kinetic Force (Piston) throughout the constant horizontal motion of the block, even though the piston is no longer in contact with the block? So the block eventually comes to rest when the Force (Friction) equals the Force (Piston), bringing the net force to an equilibrium and completely stopping?